In order to set up an online business, a good chunk of capital investment is usually required to buy products that you wish to sell. On the contrary, there’s no assurance that how much stock you’ll be able to sell for in a particular time frame that results in risking your money in unsold stock. Everyone involved in ecommerce or thinking to start an online business faces this challenges. If you’re still wavering back-and-forth, read this 4 minutes article on how to scale up your business with dropshipping while keeping stress at bay. Starting with the basics – What is Dropshipping? Dropshipping is an ecommerce business model that enables you to operate a retail business without owning a stock or holding the inventory. This is a supply chain management process, where you can transfer the orders from your customer to a manufacturer, wholesaler or just another retailer who would ship the product directly to the customer. Many big names in e-commerce started out with dropshipping. To the name of few, Amazon, Zappos, Wayfair, Blinds are top retailers for those who need inspiration. Why Should you Consider Dropshipping for Your Online Business? Ability to offer a wider range of products is something a company always aspires. With dropshipping, you can sell variety of the products because you are not spending bucks for holding the inventory. Just imagine, a retailer who sells furnishing and home décor products online and in-store both. The physical store may face problems with space for storing all furnishing items and can only put few products in-store. But, if that retailer had dropshipping arrangements of several items with different suppliers, the retailer may be able to offer more options online. Retailers can showcase any number of products without having to pay anything from their end until the customer places an order. Starting an online business always carry a financial risk along with it. You need to consider the upfront cash for packaging, inventory, equipment and space to set up everything. Starting with small inventory is fine but storing a huge number of inventory can really cost you a fortune. And what if the sale doesn’t go as planned? With dropshipping, you do not need to store products in your warehouse because the products stay with your supplier until you purchase them. Moreover, it can save you from warehouse rent, insurance, and human resources to pick-pack-ship orders, labor expenses and much more. Hence, you can run your business without worrying about spacing issues. There is an underlying risk while adding new products in your kitty as it’s difficult to predict what your customers are going to buy next. Drop shipping makes it relatively easy to explore new lines with minimal efforts. You can include the products in your store that you think will be useful and appealing for your customers. If the new products get sold, it’s a plus, if doesn’t you are not paying for it. No more commuting; no more shared cubicles… When your supplier handles pick-pack-ship and storing, you are not tied with the location boundaries. As long as you have access to the internet, you are good to go from any corner of the world. Investment and warehousing is not required to get started with dropshipping, hence it is relatively easy to set up your online business from anywhere. Zappos –One of the very popular online shoe and clothing chain based in the USA, started their business in 1999. During that epoch, the company had almost no sales; hence, decided to upsurge their sales with drop-shipping model. The team started their drop shipping business by collecting orders from the customer and transferring to the suppliers or other sellers. In shortspan of time, the company scaled new heights. The company lacked in funds; hence couldn’t afford to purchase products in bulk and store them. But drop shipping model enabled the company to minimize storage and delivering cost without investing hard earned bucks. The perfect approach in the business resulted into a high turnover and undoubtedly increased the profits! Dropshipping is one of the best business model for ecommerce and provides small start-ups with limited opportunity to compete with the large retailers. 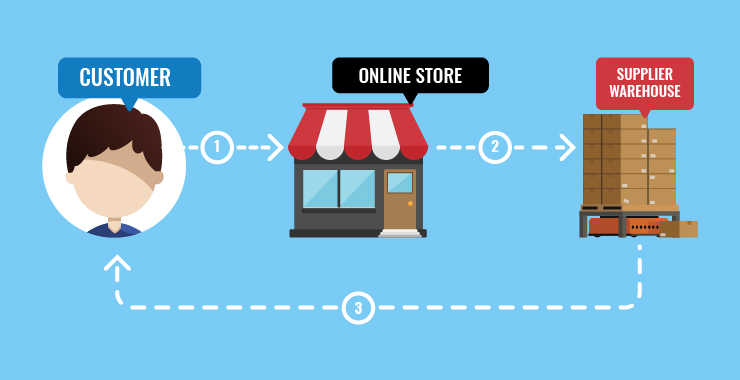 Whether you wish to build a brand new store online or wish to expand an existing business, drop shipping can be of tremendous help. A dropshipping management system can serve as a communication platform between sales channels and suppliers for quick and seamless fulfillment of online orders. Build a custom dropshipping automation software with eSellerHub and automate inventory sync, sending orders, and receiving tracking information across multiple sales channels. Get started now!